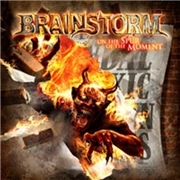 Nine albums, plus a live DVD, that is the impressive output of BRAINSTORM since the start in 1989. All three founding members; guitarists Torsten Ihlenfeld and Milan Loncaric plus drummer Dieter Bernert are still in the band. Vocalist Andy B. Franck and bass player Antonio Leva complete the line-up. For more info please see the interview dated a few weeks back. The band specially emphasize that the album was created together producer Axel Heckert of Studio 22 in Ludwigsburg. They seem that pleased, is it a necessary album to have and to hold? Well opener “below the Line” ranks among the finest I have heard from the BRAINSTORM…ever. The epic outline and the contagious mid-pace just simply does it for me. The worst that happens during the playing time is that a couple of songs come across as ordinary for the genre. There are no fillers, no dirges, no disappointments. They have stuck with the standard ten tracks, and not gone for over-long “maximum playing time value hell. They have created a lot of carrying melodies, with the vocal performance to sometimes touch on RUNNING WILD territory. The melodies and refrains deserve a special mentioning. A slight change in the track list would have been my only wish, since “My Own Hell” is not the right closing track. I say get it, and get it now. This album will continue BRAINSTORM´s victory tour over Europe!